It is just about the end of the short British forced rhubarb season, and it is always a treat to see it nestled, glowing pink in a crate at the marketstalls, and it is always sad to see it disappear, as I think it is one of the most wonderful vegetables. In Britain, the long thin bright pink stalks are grown in an area called the Rhubarb Triangle, also known as the Wakefield triangle, a nine mile square area of land contained by Leeds, Morley and Wakefield in the West Riding of Yorkshire. 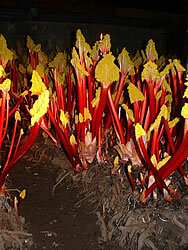 Here, the rhubarb is grown in large, heated, low-ceilinged sheds in complete darkness. Because the plants want sunlight, they are forced stretch and grow long and thin in the vain hope of catching some of the Sun’s rays. Hence it is called forced rhubarb. It is also called Champagne rhubarb by some. The rhubarb never gets to attain the green colour like normal field or garden rhubarb has; I think the biological term is chlorosed. It also never gets the chance to develop the very astringent sourness too, but it does still has the wonderful rhubarb flavour. The plants grow so quickly in their desperation to find light that you can actually hear them pop and crack as they stretch and grow. I imagine that it is pretty scary in those dark, dank sheds harvesting the rhubarb by candlelight. So what is special about West Yorkshire when it comes to growing rhubarb? Apparently, it is the unique mix of soil and climate. I know that that might sound rather trite, but I think in this case it might actually be true; Wakefield is the only place in the UK where one can successfully grow liquorice and the reason for that is because of its soil. Yorkshire-produced Forced Rhubarb has been given Protected Designation of Origin (PDO) status by the European Commission’s Protected Food Name scheme, just like Stilton Cheese, and famously not like Cornish pasties. That said the forced rhubarb I got was from Mexico. It wasn’t until the discovery that rhubarb could be forced in the 1840s that the vegetable caught on as a ‘fruit’ in crumbles, pies &c. (it isn’t a true fruit as there are no seeds). Before then, like many plants, it was grown for medicinal purposes. It was such a revered drug for treating gut, lung and liver disorders that it was worth thrice the price of opium! It was first introduced into Europe by Marco Polo from Asia during the thirteenth century, and was first grown in Britain in the mid-seventeenth century. This is my favourite way of eating rhubarb: tart fruit, sweet crunchy topping and loads of proper custard (link here for a recipe for that). I like to include some ginger in my crumble, they are a classic combination. Here I use it twice, ground ginger in the topping, and preserved ginger in with the gently stewed fruit. Orange zest and juice also work well as an alternative. Slice the rhubarb sticks into one inch lengths. If buying forced rhubarb, there should be no need for peeling, but older, field grown sticks might need it. Place the rhubarb and caster sugar in a saucepan with the ginger and syrup, plus a couple of tablespoons of water. Cover, and simmer gently until the rhubarb is tender, about 10 minutes. 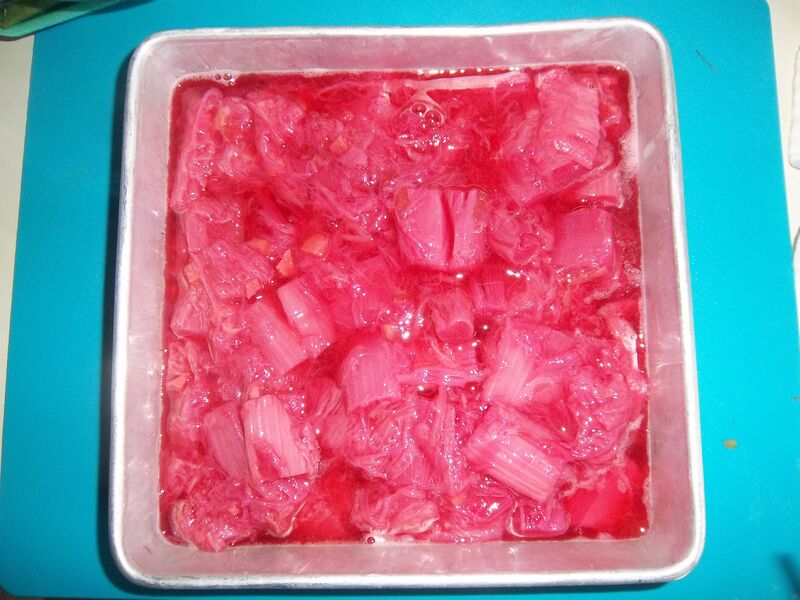 Try not to stir the rhubarb too much, as it easily breaks up. If there is a lot of liquid, take the lid off and let it simmer away a little. Add more sugar if necessary; field-grown rhubarb may need more. Cool. Meanwhile, make the crumble topping by rubbing the butter into the flour, using fingers, mixer or processor. Stir in the flour, oats and ginger. 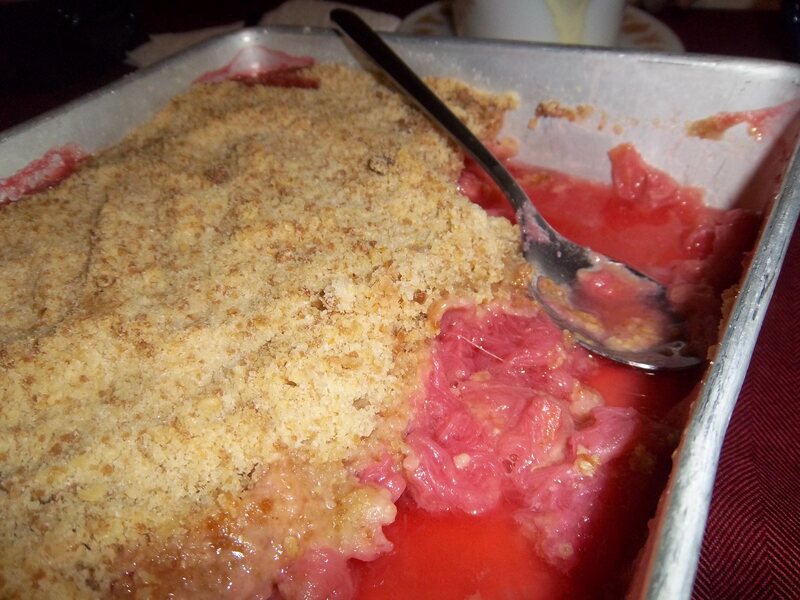 Pour the rhubarb into a pie dish, or baking dish and pile on the crumble topping. I like loads of topping, but if there is too much for you, freeze the remainder for future crumbles. Bake at 160⁰C for 45 minutes. Serve with custard, cream or vanilla (or even better, ginger) ice cream.